Galileo Galilei had argued in favor of the heliocentric model developed by Copernicus that shows the Earth going around the sun, rather than the geocentric view placing Earth at the center of everything. He ended up recanting the heliocentric view when summoned to Rome for the second trial in 1632-33. The Roman Inquisition began in 1542 — 22 years before Galileo's birth — as part of the Catholic Church's Counter-Reformation against the spread of Protestantism, but it represented a less harsh affair than the previously established Spanish Inquisition. Galileo's first trial ended with the Inquisition issuing a formal order, called a precept, in 1616 demanding he stop teaching or defending the heliocentric model. His decision to ignore the precept ultimately led to the second trial 15 years later. However, at least five other documents actually mention the precept. They include Pope Paul V's order concerning the precept; a dated record of the precept being issued; legal briefs and summaries from Galileo's 1632 trial; and the document that pronounces Galileo's sentence. These documents again reflect careless note-taking, given that they can't even agree on the exact wording of the precept, Mayer pointed out. But he added that they all have historical consistency in mentioning the precept's existence. "The idea that this was unique is not true," Mayer told LiveScience. "They were a very familiar device – many of which are incompletely recorded in the registers." "Whoever [raised the issue of the earlier precept] was doing it in very narrow legal terms," Mayer said. "The reason is they were trying to give Galileo an out." 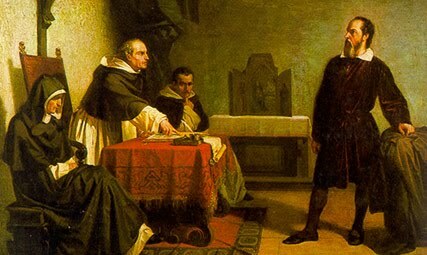 Galileo could have negotiated a settlement – a common occurrence in the Inquisition records, and one that would have been relatively easy for him considering the narrow terms of the charges, Mayer said. Instead, Galileo "didn't know the rules and deliberately kept himself ignorant of them," according to Mayer. The astronomer clumsily tried to claim he had merely received a warning, before contradicting himself by stating, "I do not claim not to have in any way violated that precept." He dug himself into an even deeper hole by then quoting the strong form of the precept during his arguments. "When push came to shove in the second part of trial, he made every imaginable mistake," Mayer said. "A lawyer could have told him not to do that." The study of the precept comes as part of a much larger project aimed at understanding the Roman Inquisition as "human beings as opposed to cardboard cutouts," according to Mayer. "The problem is just misconceived," Mayer said. "What I'm trying to do is get at the legal dimension of what happened." That may be an uphill battle. Galileo represents an incredibly powerful symbol today as one of history's most revered thinkers, and everyone wants a piece of him. In the eyes of secular Europeans, he ranks as "a myth bigger than George Washington," alongside Charles the Great, Mayer noted. The Roman Catholic Church has also attempted to "rehabilitate" Galileo's image by reclaiming him as a man of faith. Even creationists have hailed Galileo as an example of a man ahead of his time – implying that their views on the creation of life are in a similar position. "Poor Galileo is in the crosshairs," Mayer concluded.